Since 1990, 449 [”celebrities”] have died. In 75 cases, two of them died within three days of each other. But in only seven cases did three of them die within a five-day period. According to my colleague Boris Chen, a statistician, this is about what you’d expect by random chance. After the deaths of any two celebrities close together, some people are waiting for a third celebrity to die. Maybe one will, and maybe one won’t. But this idea that celebrities always die in threes is a logical fallacy right up there with the Texas sharpshooter fallacy, where we see patterns that don’t actually exist by focusing on data that support our theory while ignoring anything that would contradict it. As strange, curious humans we’re always looking for patterns, leaving us prone to believe a lot of superstitious nonsense. But when it comes to the “celebrities die in threes” garbage the first obvious question is, how do you define who is and who is not a celebrity? The New York Times combed through their obituaries and considered anyone whose obit ran longer than 2,000 words to be a celebrity. The second question: Over what period of time do these celebrities need to die for them to be considered clustered into the “threes” camp? In the Times’ research, they found only seven cases where three celebrities died over a five-day period. No doubt some will insist that a single work week isn’t enough time. But what then is a proper amount of time? Two weeks? A month? A year? It’s all so arbitrary and exhausting I’m not even sure why I’m continuing to write this sentence. If you believe that celebrities die in threes, you’ll find your own way to make the data fit that worldview. What about the death of a Bollywood actor that many Americans aren’t acquainted with? Do their deaths count in your threes theory? But wait! What if celebrities actually die in fours, and nobody’s really noticed it until now? As the Times discovered, sometimes celebrities actually do die in fours. In fact, James Brown, President Gerald Ford, Saddam Hussein and CBS executive Frank Stanton all died in the span of five days in December of 2006. On second thought, I take it all back. Celebrities die in fours and the lamestream media have convinced you that it’s threes. Factually regrets the error and apologizes for this post. 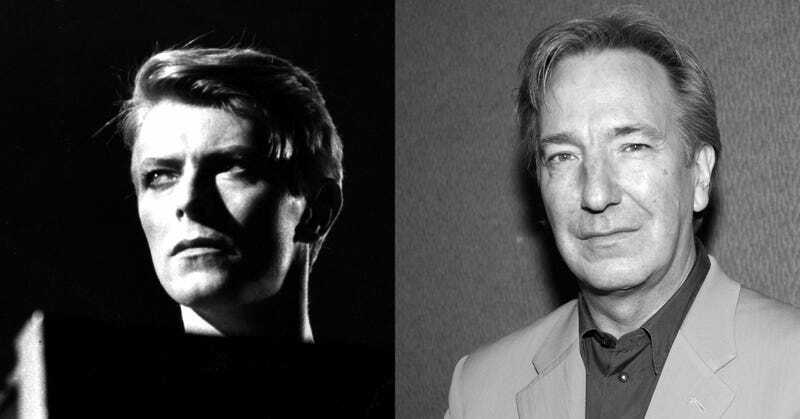 Photos of David Bowie and Alan Rickman via Getty. This post was formerly about Robin Williams and Lauren Bacall and originally posted on August 15, 2014. It will be updated every time social media explodes with idiotic “celebrities die in threes” nonsense.